At Conaway Motors we know that auto repair in Lake Stevens is not a favorite holiday gift, but here is a story to remember. Back in the 1980’s a young woman returned to college when she realized that she could not support her three young children on minimum wage. Returning to college had its own stressors, including a 60-mile commute from her home to her classes. With all of the financial challenges of feeding and clothing three youngsters and purchasing the required supplies for classes, she saved money wherever she could – including driving an old clunker of Pontiac. The thing was a boat, and was always one tire thread away from a blowout and one spark plug away from dying and not moving again. 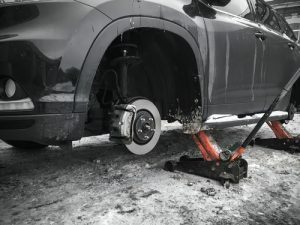 One snowy afternoon, she was driving home with her twelve-year-old son and the two younger ones, when she heard the tell-tale slap-slap-slap of a flat tire. She pulled over, and she and the boy got out the gear to change the tire. The jack was an old mechanical one, and the car was big. She and the boy together could barely ratchet the vehicle up on the jack. A truck drove by and tooted his horn merrily. It made the woman angry, but not fifteen minutes an older man in a pickup truck pulled up to help change the tire. The trucker had contacted him on his citizen’s band radio, and the man had come to help. It was a gift the woman would not forget; a kindness from strangers. At Conaway Motors, we know that auto repair in Lake Stevens is not a favorite holiday gift, but they may be necessary. Stay safe on the winter roads, and call us at (425)905-2424 if you need timely repairs.